OpenOffice.org v2.3.1 has been released. With a new version of Mozilla Firefox v2.0.11 released just last week, look for version 1.83 of the TTCS OSSWIN CD in time for the weekend. 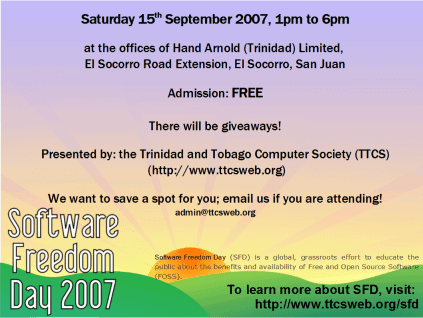 The Software Freedom Day (SFD) Competition 2007 results have been announced by the Software Freedom Day organisation and the Trinidad and Tobago Computer Society’s entry for SFD 2007 received a “highly commended” award from the Software Freedom Day organisation! Tux Paint v0.9.18, the fun open source drawing program for kids is available from New Breed Software for Windows 2000/XP/Vista and PowerPC based Macs (versions for older Windows 98/Me, Intel based Macs will be available soon). A key feature of the new release is the ability to write and add your own “Magic Tools” plugins. Read the Tux Paint press release for more details. At the recent Trinidad and Tobago Computer Society (TTCS) Software Freedom Day event on September 15th, 2007, Mike Tikasingh recorded some video footage with a camcorder. Thanks to Mike’s hours of editing, we have a 18 minute video of the TTCS Software Freedom Day 2007 event which also features the TTCS new logo! ttcs_sfd2007.ogg, a 75MB OGG file. ttcs_sfd2007.avi, a 40MB XviD file. TTCS_SFD2007.mp4, a 105MB MP4 file. Meeting on Sept 8th, 2007 went well and the TTCS will be having a meeting on Sunday 9th, 2007 at ENCO from 10am to continue preparatory work for Software Freedom Day on September 15th, 2007. You can read a summary of what happened on Sept 8th, 2007 and other TTCS SFD preparations at the TTCS SFD wiki page. The Trinidad and Tobago Computer Society Software Freedom Day event flyer (PDF ; 180K) has been uploaded. Print and redistribute! Also see the TTCS wiki page on SFD to keep track of the TTCS preparations for the event. We will be celebrating Software Freedom Day 2007, a global, grassroots effort to educate the public about the benefits and availability of Free and Open Source Software (FOSS). Anyone interested in computing and related technology are welcome to attend this event. While stocks last, attendees will receive the TTCS OSSWIN CD and Ubuntu CDs (or any Linux distro) free of charge. Additional linux distros can be obtained for $5 TT each. demoing open source software (OSS) for Windows from the TTCS OSSWIN CD . demoing Ubuntu , a popular Linux distribution. how to install Ubuntu on your Windows PC (dual booting). how to use a Linux “live” CD (no need to install Linux on a hard drive). how to do common computing tasks using Linux and open source software. Please let us know via email at admin at ttcsweb d.o.t org if you are attending and what distros you may be interested in getting) so we can prepare the venue accordingly.